For a long time now, Lex Luthor has been a villainous businessman, so that's how a lot of fans think of him. But when he first appeared, he was anything but: in fact, he was just another mad scientist out to rule the world. Of course, he was always stopped by Superman, so he needed to invent some way to protect himself from the Kryptonian. A genius, criminal scientist, Lex builds a suit of battle armor, incorporating the most deadly weapons, in order to bring down The Man of Steel. At one point, Luthor did succeed in taking over the world - the only problem was that the world he took over wasn't Earth. It was Lexor, the world shaped like a pyramid with a giant pillar of light shooting out the top. No, wait, that's the Luxor. It's a casino. Lexor was once a technologically advanced world, but tv made its inhabitants forget how to run things. Lex happened along and rebuilt their society. Now, he only wanted some zippy new rayguns to shoot at Superman, but the Lexorians viewed him as a savior and their world's greatest hero. Luthor managed to find a long-forgotten suit of armor that put him on equal footing with Superman... and also destroyed his adopted planet. Along with his wife and child. See you in hell, Lexor! The armor lasted through the end of Crisis on Infinite Earths, which is precisely the figure line that has given us this figure today - DC Direct's CoIE Series 2. The figures come in the same kind of blister as Series 1 did, and they all have the same Crisis logo base. The suit is looking great. It was designed by George Perez, the master of the intricate costume, and all the wee details are captured in plastic. His arms and legs are banded metal, and there are big spikes down the sides of his boots. He's got a skirt for some reason, and a triangular symbol on his chest. Thin silver tubes run from his shoulder pads to right near his mouth. The suit's got the goofiest high collar ever - it's a solid piece and slopes up from his shoulders to above his head. Why, when creating a battle suit, would you do your best to limit your own field of vision? He'd be able to see more looking through the mail slot in a door. The face in there is great, but you can barely see it. 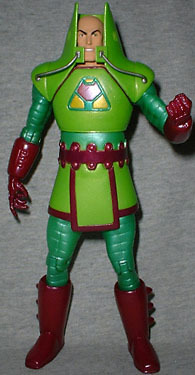 The armor is green and purple, Lex's signature colors. There are two shades of green: his body is light, while the arms and legs are a darker metallic hue. The purple is nice, and the head, though nearly inaccessible, is painted nicely, and the symbol on his chest is a crisp three colors. The sculpted detail on his gloves gets lost way too easily, and could have used a paint was or something to bring it out. Granted, the flat colors capture the look of the comics, but you may want to give this the Gundam treatment, outlining the seams. Lex is articulated well, for a DC Direct figure. No waist, of course, but the rest is good. 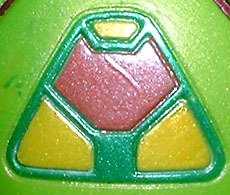 He moves at the boots and knees, and his hips are actually balljointed Mattel's Batman or He-Man figures were. His wrists turn, he's got hinged elbows and balljointed shoulders that actually have a wider range of motion than most DCDs. His head is balljointed, but you have to ask why. You can't get at the damn thing to move it, so why bother? Why not glue it in place and give him a waist? As a standalone character, Lex Luthor has probably gotten just as much of his character from outside sources as Superman has. When he first appeared in Action Comics #23, Luthor was an evil scientist with a full head of red hair - and no other name. He was just "Luthor." Could have been a first or a last name. An art mistake in the newspaper strip in 1941 saw Luthor portrayed as completely bald, and that was quickly adopted by the regular comics. He was given the first name Lex when he showed up in the movie serials, and that was made official in Adventure Comics #271. Heck, even this armor was from another source. Yes, he first put it on in 1983's Action #544, but it wasn't created for that issue. Yes, it was designed by George Perez, but he did it for Kenner's Super Powers line: the comics just adopted the look. And since this figure is based on the comics, that means it's a toy based on a comic based on a toy. How meta! This armor is pretty iconic for Lex, so it gets plenty of action figure lovin'. It was available in the animated line, on one of the new movie figures, and will soon be available in Mattel's DC Superheroes line. Plus, look for another version of it from DCD next year. For now, this is the best large-scale version - because it's the only one. Mattel's prototype shots look better, so no one would blame you if you want to wait.